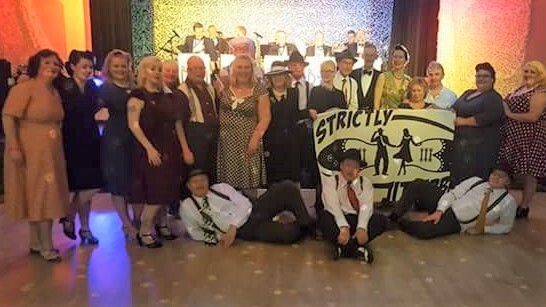 ADULT BEGINNERS Swing & Kick Jive are 6 week courses, next one starts on Monday 8th May at Kenilworth, Bedworth starts on Wed 10th & Thursday 11th is at Overslade Community Centre Rugby. Full address details further down this page. What we do, is teach small groups of people, with a max class size of 30-40.This means we can give good, individual, help & tips. Alistair always uses a head mike, to make sure everyone hears easily. If you book the course, and pay in advance, you get 6 lessons for the price of 5. Pay as you go, JUST £7 per evening (Bedworth £5) under 16's £4 Social entrance £4. You can join us on any date (except week 6), as we start each lesson with Beginners footwork and you do not have to bring a partner, (though it helps) as we work a rotation system (with a provision for those who do not want to rotate or have a cold). We also do a weekly Cardiac Rehabilitation session for the QE Hospital in Birmingham, teaching people with heart problems. I cannot remember them all, but we have attended a LOT of dance workshops with teachers from all over the world, and have learnt from Frankie Manning, Julie Oram, Simon Selmon, Gary & Sara Boon, Rob (Van Haaren) & Dianne, Kevin St Laurent (First with Carla, later with Jo), Marcus & Barbl, Steve & Heidi, James & Bridget, Mike & Mel, Joseph Sewell, Mel & Jo Calanglang, Trisha Sewell, Alan Axon (All Ruzzit Buzzit), Marc & Hoc, Paul & Debbie, Paul & Fae, Nicky & Jim, Surrey Jive, Francis & Andy, Dai & Sharon, Ryan & Jenny and last, but also first for Alistair, Dancin Dave.